Today’s Instagram round-up has some of my favorite looks from our beach vacation last week which has me SO excited for spring and summer! Also sharing some travel looks, workout outfits, and just casual everyday wear with Y’all. hope you’re having a great weekend so far! one of my favorite workout sets! it’s super comfortable, the cutest color blocking, and never shows sweat! it lasts a long time, too, and is great for any kind of workout! so obsessed with this off the shoulder bikini! the pattern is so bright and colorful, making it perfect for a beach getaway or day by the pool. definitely recommend buying sooner than later cause by the time spring break rolls around or it’s summer, this suit may be sold out! seriously love the pretty embroidery and the boho look of this dress. and it isn’t see through at all! comes in several other colors too. I got these espadrilles last year and I’ve worn them SO much! they’re surprisingly comfortable (truly!) and literally go with everything. well the Instagram round-up just wouldn’t be complete without some comfy pj’s. I love this tank and shorts set, plus it comes in other colors and patterns too! here’s another fun suit I got for our trip to Jamaica! the embroidery is so pretty and just has such a fun, tropical look to it. plus it’s a triangle bikini top that isn’t too revealing, so you don’t have to constantly adjust it. Y’all I wasn’t kidding when I say I can never say no to stripes. this top has such an effortless look to it and would be so adorable paired with jeans too! also loving these platform slides. so great for everyday wear and casual summer outfits! aaand more stripes…haha! but honestly, this PJ set is so soft and comfortable. they’re almost too cute to just wear to bed! but I love them and love how they fit. loving this star print bikini that’s also revisable! the fit is so flattering and it has the cutest scalloped edges too. this shorts also fit like a dream! super flattering and not too short or baggy. stripes + peplum + ruffles = most perfect spring top ever. plus these denim shorts are legit amazing. the length is just right – not too long and not booty shorts. the most darling white dress! it has so many intricate, feminine details throughout and would be a great option for any brides-to-be! plus, can y’all tell this will be my go-to bag for spring? you have to get yours before it sells out! found this floral print tank recently and it was love at first sight. the print is just adorable and I love the colors! such a great tank for spring/summer. plus these white shorts are literally the best I’ve found in years! they aren’t see through and the fit is on point. y’all need these in your life! 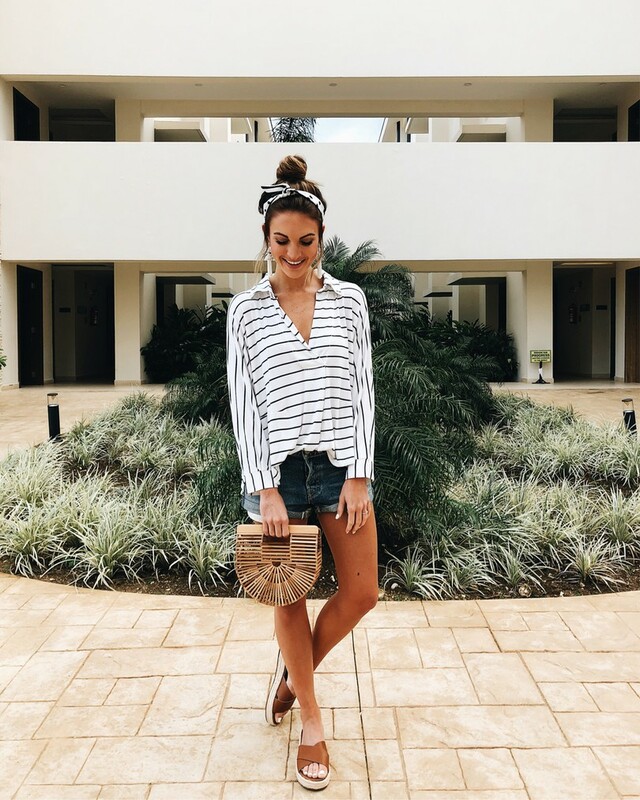 the coziest striped top for the (long) trip back home! this is a super lightweight tee that can also be worn off the shoulder. and these platform espadrilles are another spring shoe I’ve been loving lately. I just couldn’t say no to those cute blush bows! this boho striped dress may be my favorite for our Jamaica trip. the length is perfect, it has pockets, and I just love it for the beach or any summer event! oh and I love the back of it too! this bralette is SO pretty and I love pairing with my more loose-fitting tees like this one. it’s also so cute under tanks, too! here’s a round-up of the best weekend sales going on, too!